As part of the VAFF project (Visual Arts: A Flourishing Field), the A.M. Qattan Foundation (AMQF) organised an encounter in Gaza on the Palestinian artist Sliman Mansour’s painting Jamal al-Mahamel. This encounter was hosted by Shababeek for Contemporary art in Gaza on Saturday, 26 January 2019. Nine artists and art enthusiasts from the Gaza Strip took part in this event: Do’a Qishta, Yusri al-Ghoul, Mohammed al-Haj, Nabil Abu Ghanimeh, Majdal Nateel, Salman Nawati, Maysara Baroud, Sohail Salem and Suheir Joudeh, in addition to the artist and guest speaker Khaled Hourani who joined via Skype from Ramallah. The encounter, which was led by the artist Ala’ Younis, discussed a new literary work by Hourani entitled “Oil on Canvas: The story of the search for Jamal al-Mahamel”, and the importance this work of Mansour’s has acquired as part of an artistic movement and practices documenting political, artistic and economic developments and events, both in the Palestinian scene and outside. 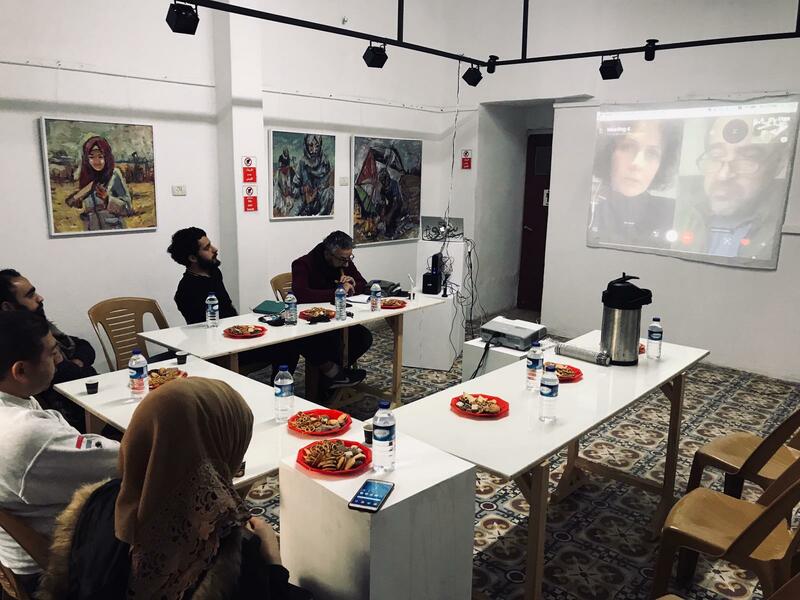 This meeting was the fourth organised by the VAFF project as part of its interventions that aim to further develop the knowledge, tools and skills of artists and researchers in the Gaza Strip. The programme began in December 2018 and continues with fortnightly meetings until April 2019. The participants made their own contributions to the encounter, describing their experiences with Jamal al-Mahamel and other artistic works that had influenced their developments as artists and researchers in the early stages of their life and work. The first meeting invited the Egyptian writer and film producer Ali Hussein al-Adawi from Alexandria to analyse the film Inextinguishable Fire (1969) by the Egyptian director Harun Farocki. 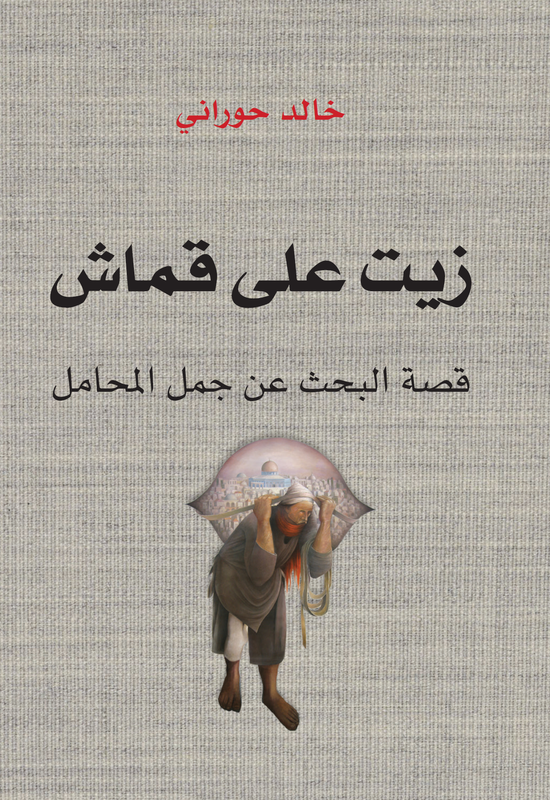 Al-Adawi discussed the film as a turning point in the production of films that are politically committed, or that deal with causes or choose an unusual path in the general context of producing films with a message. The participants discussed the ways in which the film employed the violent imagery of war, and the relationship that arms companies had with constructing this picture, as well as the position of the artists and directors in these production processes. The second meeting hosted the Jordanian/Palestinian artist Raed Ibrahim, and covered discussions of the position of artists writing texts and receiving funds, and their awareness of their position in the divisions of cultural labour. This was discussed through the reading of a text by the artist Felix Gonzalez-Torres (that had been translated into Arabic), and through watching a screening of Pier Paolo Pasolini’s film The Paper Flower Sequence (1969). The third meeting was held with the Palestinian writer and researcher Adania Shabli, in which the group discussed “Clues: Morelli, Freud and Sherlock Holmes” from the works of Carlo Ginzburg (translated by Arij Batta). This text touches upon the way that people see the world, how knowledge is changed by being marginalised, and how small details can be reread to redefine narratives, artworks, or history as a whole. Shibli also presented European artworks that demonstrated transformations in how we deal with the different elements of a painting.